A proper body posture is something we should all take proper care of, as it has been shown that it effectively helps digestion, boosts overall health, enhances breathing, lowers stress, regulates hormonal balance and supports mental clarity. On the other hand, bad body posture raises the risk of back pain, poor blood circulation, and tightness in the chest. Therefore, you should do all possible to correct it, and thus soothe the pain and tension in the back, neck, and shoulders. Fortunately, you can succeed in this in a simple way, by exercising the muscles used in a natural, standing position. 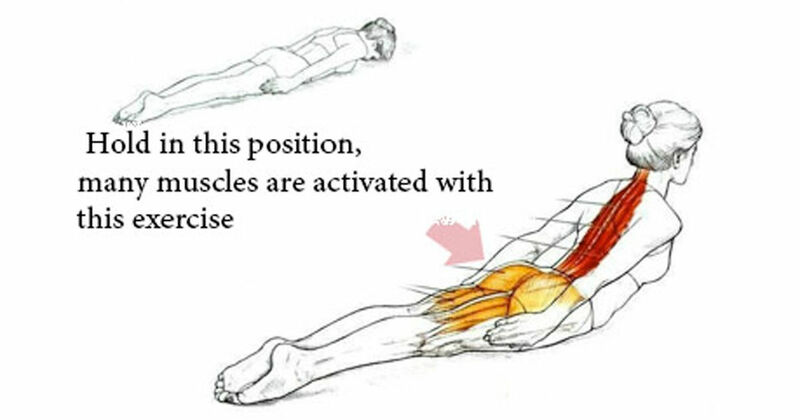 The locust pose, or shalabhasana in yoga, is an exercise that strengthens the muscles and provides amazing effects. Yet, if you suffer from back pain, consult your doctor before this or any other similar exercise. In a lying position, with the face downwards, and the forehead touching the floor, stretch both legs and spread them hip-width apart. The weight of the body should be divided equally on the tops of your feet. Then, raise the upper body as high as possible, keeping the head up. Inhale and elevate the head, and the lift the hands as you exhale. The hands should be near the body, with the palms faced downwards. Next, just raise the legs using the thigh muscles, and concentrate the weight on the lower ribs, pelvis, and abdomen. Hold for 10 to 60 seconds, and do 5-10 repetitions. This exercise will improve your body posture, and strengthen the muscles of the legs, torso, and back.